Say this about young Robert Pattinson: Even a major tabloid scandal can’t prevent him from promoting the artsy indie movie he made to prove he isn’t just a Twilight sparkly chest! Last night, Pattinson emerged from what had been described as self-imposed exile to tape The Daily Show and plug Cosmopolis, the David Cronenberg–directed Don DeLillo adaptation he stars in. Before the “K-Stew Cheats!” headline deluge, Cosmopolis (which opens in limited release this weekend) would have flown more or less under the radar. 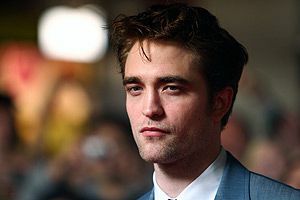 It’s probably Pattinson’s most experimental, most ambitious work outside his bread-and-butter franchise, but with another Twilight installment to go, most Hollywood observers aren’t too concerned with the future of Rob’s career just yet. But now that the Cosmopolis promo tour comes right in the middle of all the hubbub, does it actually have a chance of riding Pattinson’s coattails to box office glory? Eh, probably not. As Jon Stewart very gingerly points out during the segment, as soon as they started chatting about the movie and not Pattinson’s personal life, large swaths of the TV audience decided to go make a sandwich. And it’s that kind of blunt-but-sweet treatment that makes Stewart the perfect guy to interview Pattinson right now. Stewart barely lets the embattled fellow get a word in, mostly ribbing him about the breakup with Ben & Jerry props and shots of the tabloid photographer battalion stationed outside The Daily Show studio. Basically, Stewart acts like a swell guy, not skirting around the situation altogether but avoiding squeezing the poor guy for the gory details and making it clear he genuinely wishes him the best. OK, but, by the way? If this whole tabloid situation does end up being an elaborate ruse cooked up by Cronenberg and DeLillo to juice up anticipation for Cosmopolis? Let’s just say I called it first.